This series takes place in a world with no men where the magic comes from a toxic species of solitary bees. I took a month at the end of 2018 to work solely on the worldbuilding and I have about 75 pages of notes on everything from geography, demographics, flora, fauna, economics, culture, science, technology, and religion. And then, of course, there are pages and pages of backstory of my main characters. I’m really looking forward to introducing them to you! After a brutal assassination, a young noblewoman, a novice constable, and a reclusive cleric are all on the hunt for a killer. Fate, magic, and death bring them together, but can they trust each other? I don’t have a title chosen for this one yet, but these things often come to me as I’m writing the first draft. The outline is complete though. This time I decided to outline the entire trilogy before I started writing so I know what happens with our heroines, but not what the story is called just yet. Originally, the entire series was going to take place in the small city of Edinshire Reach. I even drew a map of it! 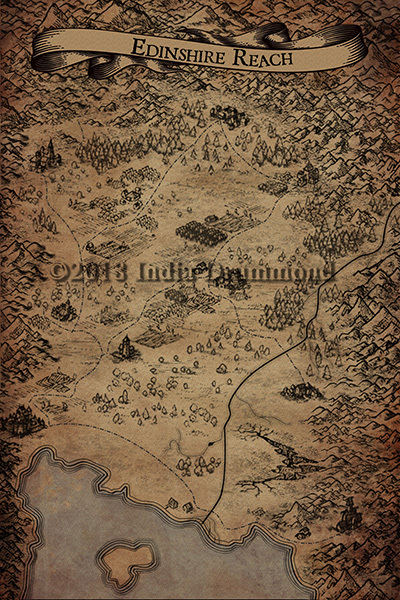 But as I started working through the outline, it made more sense to move the series to a larger city: Iverhallow. But this third book will take the characters to the mountain city, so I gave the book this as its working title. So during my worldbuilding phase, I created this map of the region of Edinshire Reach. Well, once I got into the outlining phase, I then decided to move the first book to the capitol city of Iverhallow. Oh no! But, one of the main characters, Andreva Monaste, was born in Edinshire Reach, and the story will be returning there in Book 3, so at least that means that all my work wasn’t wasted. What it does mean is that now I have to create a map of Iverhallow. Even though it’s a city, it’s a large one, with a population of about 600,000 people. That means there are a lot of districts and areas where a reader might get confused. So I’ll be mapping that out. I have to admit, though, that I really loved this map of Edinshire Reach and was disappointed that it doesn’t come into play in Book 1! Oh well. That happens!